In Boerne v. Flores the Court dealt with the separation of church and state. 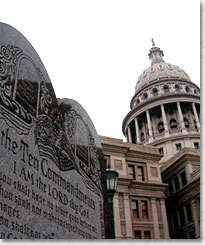 Above, a memorial of the Ten Commandments in front of the Texas State Capital building. In Boerne v. Flores (1997), the Supreme Court ruled that Congress exceeded its authority when it passed a law that, among other things, prohibited the states from regulating religious uses of land. As in Cooper v. Aaron (1958), the Court asserted its primacy in matters of constitutional interpretation and struck down a governmental act that challenged that primacy. Though Boerne was originally filed as a lawsuit claiming religious freedom violations, the case was resolved through the more basic constitutional principles of separation of powers and limited government. Boerne involved the proposed expansion of a Catholic church in Boerne, Texas. The church, built in 1923, was an historic, mission-style structure designated as a landmark by the city, which had nonetheless become too small for its growing parish. The Catholic Archbishop of San Antonio, Patrick Flores, applied for a permit to expand the church, but the City of Boerne denied it, maintaining that the church qualified as a historic structure under the city's historic preservation ordinances, and that local zoning laws forbade the expansion. In response, the archbishop filed a lawsuit against the city in a local federal court. He claimed that the Religious Freedom Restoration Act (RFRA), passed by Congress in 1993, prohibited "governments" like the City of Boerne from "substantially burdening" a person's exercise of religion unless the government proves the burden "is in furtherance of a compelling governmental interest and is the least restrictive means of furthering that ... interest." The court dismissed Flores's suit and ruled that the RFRA was unconstitutional because it exceeded the limited powers of Congress. The archbishop appealed to the Fifth Circuit Court of Appeals, which reversed the district court, holding that the RFRA was a constitutional exercise of congressional authority. The Supreme Court reviewed the case in 1997. Justice Anthony Kennedy, writing for the majority, began the Court's analysis by examining the intent of Congress in passing the RFRA in 1993. The act had been passed in response to a Supreme Court ruling that a state may restrict its citizens' religious practices so long as such restrictions are "generally applicable," or do not specifically target religion (see Oregon v. Smith , ruling a state could ban the use of peyote in Native American ceremonies under a general drug law). Congress, concerned that the case infringed upon the First Amendment's protection against laws "prohibiting the free exercise [of religion]," passed the RFRA to protect religious practices more strictly. But did Congress have the power to pass the act? Archbishop Flores argued that it did, under Section 5 of the Constitution's Fourteenth Amendment, which allows Congress to enforce the First Amendment's provisions against the states. The Supreme Court, while acknowledging the archbishop's argument to be generally true, nonetheless ruled that Congress was exceeding its power in passing the act. First, Section 5 only allows Congress to enforce the terms of the First Amendment as they are defined under the Constitution. Second, interpreting the terms of the Constitution is the duty of the Supreme Court, not Congress. The Court had previously ruled that states may pass "generally applicable" laws restricting religious practices without violating the First Amendment. Because laws like the City of Boerne's historical preservation measures were "generally applicable" laws, Congress lacked the power to challenge them under Section 5. In short, Congress was not enforcing constitutional religious freedom protections, but writing new protections against local governments above and beyond what the First Amendment guarantees. The Constitution does not give Congress such a sweeping power in Section 5 -- or anywhere else. Thus, the RFRA was declared unconstitutional and the City of Boerne could block the expansion of the church. Boerne v. Flores underscored the frequent tensions in constitutional interpretation between the courts and representative politicians. No doubt pressured by their constituents to increase religious protections, members of Congress passed the RFRA assuming they were strengthening constitutional liberties. Instead, Congress was found to violate the Constitution itself, both by exceeding its limited powers (see McCulloch v. Maryland ) and improperly engaging in "judicial review" (see Marbury v. Madison ). Boerne, a case that touched on the most pressing issues of religious freedom, was thus resolved by the most fundamental principles of American constitutional democracy: limited government and separation of powers.